Your forklift’s tyres do a lot more than help your truck move around the warehouse… Unlike car tyres, those on a forklift are absolutely necessary to keep your operation stable and safe. But how do you know when a tyre becomes dangerous? And how can you stay safe for longer? Frighteningly, it’s an area where 28% of companies get it wrong: 3% of tyres are replaced too late (which puts operators and their co-workers at risk) – while 25% of tyres are replaced too soon (wasting natural resources and cash). The best approach is to get the maximum wear from every pound you spend on tyres – and then change them at exactly the right moment to be safe. Here are five tips to help. 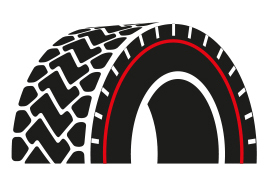 If you’re in any doubt at all, ask get in touch with us for advice on the best tyres for your truck and workplace. 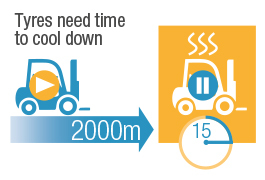 Good quality tyres can move 14% more pallets in a single shift. Manufacturer-approved tyres may look more expensive at first, but their long-term impact on safety, productivity and maintenance costs can mean they’re really the most economical option. Also, tyres with cheaper compounds wear more quickly – and less evenly. As a result, trucks can be running dangerously below the ‘standard’ 60J line – in places. Heat is the number-one danger to tyre rubber – and they need time to cool down. As a rule of thumb, tyres can go 2 km before they need a 15-minute break. Above: It is surprising how quickly 2000 metres is covered in a normal shift. Tyres that are not ‘rested’ after that distance can quickly overheat and reduce their service life – or worse, fail. But as the amount of natural rubber in a tyre decreases – whether due to wear, or cheap tyre compound and construction – there is less opportunity for heat to spread out… so the risk increases significantly. Maximising tyre safety isn’t just about choosing the right tyre: it’s about the right truck, too. 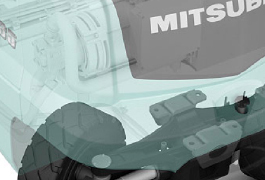 Some forklift trucks are carefully designed to preserve tyres when they steer – for example, the rear wheels on the new Mitsubishi EDiA turn out to a full 100 degrees, while four-wheel drive also minimises tyre load. Many forklifts’ steer wheels ‘push’ on tight turns – meaning the rear tyres slide on the floor. Well-designed steering systems (like the Mitsubishi EDiA EX, shown above) do not ‘push’, extending tyre life and improving safety. The result? Tyres stay fresher, safer and more productive for longer – saving you money, while also delivering more productivity every day. Hint: look out for black rubber marks on your warehouse floor. They’re a sign of excessive tyre wear. As obvious as it sounds, simply checking your tyres’ condition, damage and wear can improve safety, cut costs, and make your trucks more productive. If the tyres are fine, you can use them longer and save money – and when the tyres become unsafe, you can prevent damaging goods and the risk of a serious injury to your team. Either way, you win. If you’d like any guidance on tyre choice and inspection procedures, we’re always happy to help. Get in touch today to find out more. Download our FREE INFOGRAPHIC on the crucial test that too many companies fair when it comes to Forklift tyres.